All are fitting adjectives to describe my thoughts and reflections regarding the medical mission trip I took to Honduras for the Indiana University School of Medicine Alternative Spring Break Trip (IUSM ASB). The trip included nine first-year medical students, five second-year medical students, one third-year medical student, one emergency medicine physician, four family medicine doctors, one general surgeon, one infectious disease doctor and a local Honduran 8th-year medical student. 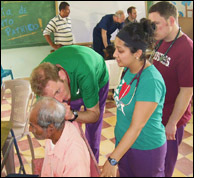 In total, the group was well equipped and able to provide compassionate and quality medical care to over 900 Hondurans in and around the village of Rigores on the north coast of the country. Days started early...ended late...were long and hot...and were tiring. However, the students learned medicine, discussed and reflected on issues around social justice and were able to reflect and think about their own ideologies and philosophies regarding resources and healthcare. Even physicians on the trip were allowed to reflect and discuss the utility of short term missions trips, use of scarce resources, and the philosophy of 'first, do no harm' both in the US and abroad. Suyapa (name has been changed) was one of the first patients seen by the brigade. Hearing Suyapa's life story puts her clinical story in context. Her depression makes more sense. Her desire for another child is understandable. Her background of living in poverty and being homeless explain her lack of proper dental care. But does my management of this patient change knowing her story? As a physician and student of medicine and public health who is deeply interested and invested in the social context of health and health care, I am intrigued by Suyapa's story, and believe that it better explains her risks for poor health outcomes and barriers to good health care. If I allow myself to become trapped in the mindset of the 15-minute clinical visit, then knowing Suyapa's story won't change much. I will continue to think I will not have the time or resources to change anything. But if I step back from that - easier to do in Honduras where resources not time are the main constraint - then I can weave Suyapa's and my patients' stories into their medical management. More importantly however, I will approach my patients' future clinical encounters with a different ear, listening just a little bit longer, understanding just a little bit better. At the very least, understanding breeds empathy, and if I am more empathetic to my patients and their stories, I am certain I will ultimately provide better care. Without a doubt, Rigores and I were made better by the IUSM ASB medical brigade.